The house where my great-grandfather first lived in America is gone. It's a parking lot now, overlooking the ramshackle remains of a once booming rubber plant on the other side of the train tracks. As I drew the view from what would be the back of the house, I tried to imagine the first impression Daniel O'Connor might have of his new home, back in 1893. It certainly wouldn't be one of spacious skies and amber waves of grain. Rather, it would be one of soot, screeches and stink. Not everything would be unfamiliar for this immigrant, however. Daniel was a city boy from the city of Cork, Ireland and he followed his older brother Frank to Chelsea, Massachusetts - living with him and his family at first. At that time, this crowded little city across the river from Boston was swarming with Irish immigrants - as well as other new groups such as Jews from Russia. Like almost all American immigrants, my ancestors came uninvited, and they took on the least desirable jobs. 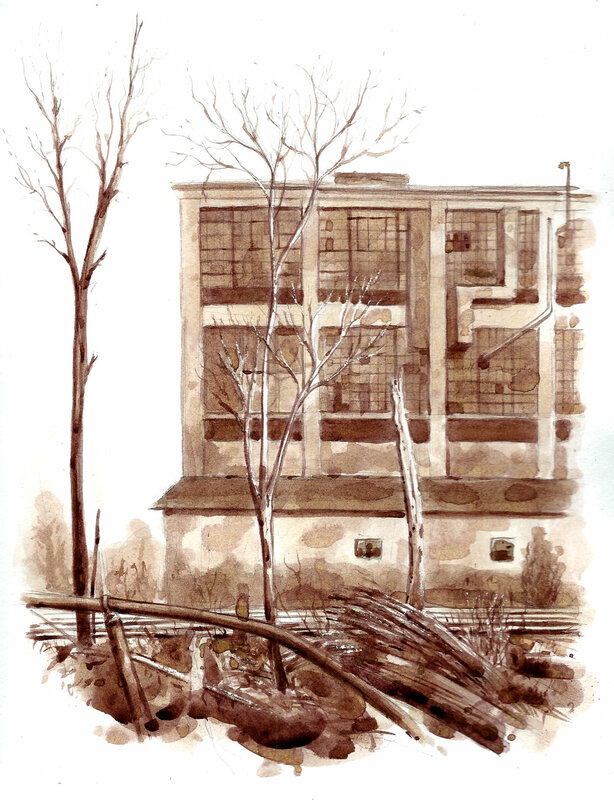 For Daniel and Frank, that was working in the factory they faced, the Revere Rubber Company. They were "mixers" according to the 1900 census. Lots of men who lived on their street worked there. Before me now is a sad shell of the showcase structure featured in an advertisement of 1918, when it was built. My relatives worked in the building that preceeded this one. My guess is that the Great Chelsea Fire of 1909 that brought the older building down. Before it was rebuilt, Daniel and his young family had started again in a another industrial city, Providence, Rhode Island, where he would work in another rubber factory for his entire life. Frank moved on to Roxbury, on the other side of Boston, and also returned to work in another rubber factory. Their children went on to be service workers rather than factory workers.